This is a super product that seals in minutes, and it is easy enough and safe enough for even a beginner to use. Well, if they follow the directions and think safety first. Some people have even called Green Glue a miracle product, because just a thin layer will be extremely effective to noise prevention. There is certainly a science behind it, but to understand it you have to know a bit about the method in which sound waves travel. In a nutshell sound will travel n airwaves in the form of vibrations. When the sound hits a barrier like a wall or ceiling, it causes vibrations to pass through. Naturally the sound comes out on the other side, right? Well, Green Glue does not allow it to enter of escape, whichever the case may be. This is because those vibrations cannot travel though a dampened surface, and before you even think it, no; using Green Glue puts you at no mold risk whatsoever. What happens is the Green Glue is actually a polymeric formula which convert’s mechanical energy away from sound. Because of its makeup and dampening abilities thereof, rather than sound passing through the wall or ceiling, it is converted into energy that dissipates as heat. What is more awesome is that something as simple as Green Glue can void out 90% of outside noises. What an investment! Look, insulation alone won’t noiseproof your home. Don’t get us wrong, insulation is still very important, but it alone is simply not enough. Green Glue will make all of the difference, and it is an affordable soundproofing method. This is an amazing Noiseproofing agent that seals in minutes. 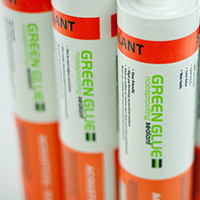 It doesn’t take long to apply it, and anyone with a good eye for construction and even beginners in some cases can apply the Green Glue Noiseproofing Sealant. Just carefully go along all of the cracks and edges. In 48 hours it is dry. Ah=gain, this is a product that meets Formaldehyde Emissions requirements and it has a strong mold resistance. It is safe to use in your home and around your pets or children. You do not have to take any classes or be licensed to use Green Glue. Just read and follow the directions. There are even YouTube tutorials if you learn from seeing matter than reading. It is really not that big of a deal, but it makes a really big impact. Clean up is as easy as warm soapy water, and once dried it can easily be painted over. Finally, Green Glue meets safety and environmentally friendly standards while reducing almost all outside noise. How can you not consider such an effective, safe and affordable Noiseproofing option? Green Glue just makes sense.